• BRAND HERITAGE: With its rich gold color and bracing scent, is the bar you can trust for deodorant protection and long-lasting clean. • KILLS BACTERIA: Trusted antibacterial deodorant protection technology that kills odor causing bacteria long after you wash.
• ODOR PROTECTION: Round the clock odor protection to help you feel clean and fresh all day long. • MOISTURE BALANCE: Clean rinsing and hydrating formula for the perfect balance of clean and moisturized. This is the bar that built the Dial Company. 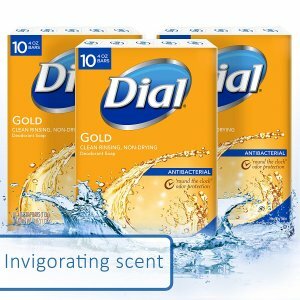 After more than 60 years, this icon, with its rich gold color and bracing scent, is the bar you can trust for deodorant protection and long-lasting clean.